Mournhold Guardian is a common Agility creature card. It is part of the Core Set. 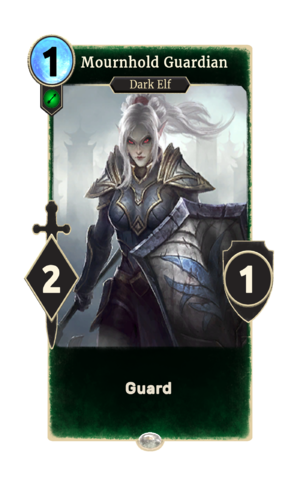 It can be included in decks, but can also be summoned by Sadras Agent or Mournhold Traitor. "By the Three, I will spill your blood!" "Come and have a taste, fetcher." The card is named for the Morrowind city of Mournhold. This page was last modified on 15 February 2019, at 13:55.